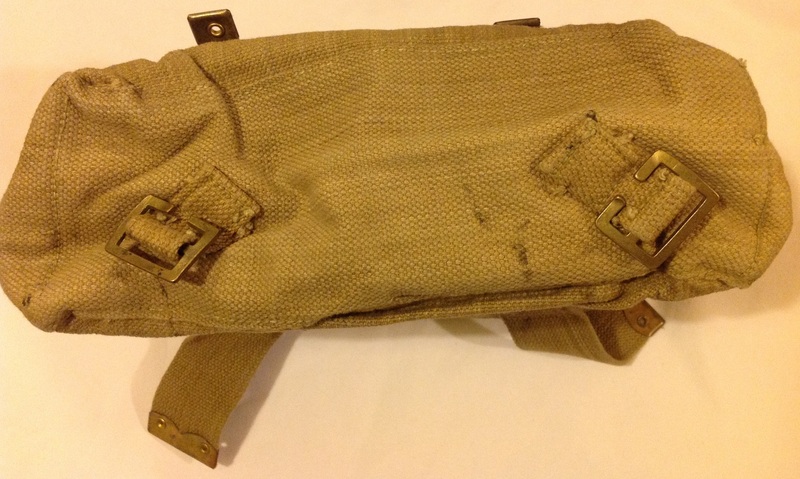 Today’s second hand market only yielded up a single piece of militaria for the collection, but it is rather a good one! Long before we had 3D cinemas, stereoscopes were very popular. 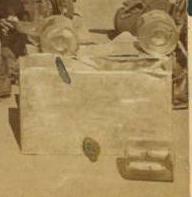 A stereoscope works by providing two slightly different images side by side. One is viewed by the left eye and one by the right and the brain combines them together to make the image appear to have depth. In 1861 Oliver Wendall Holmes created a simple and cheap viewer that allowed images to be viewed by a wide audience. These became very popular and commercial companies produced a huge range of images of landmarks, people and scenes from around the world. 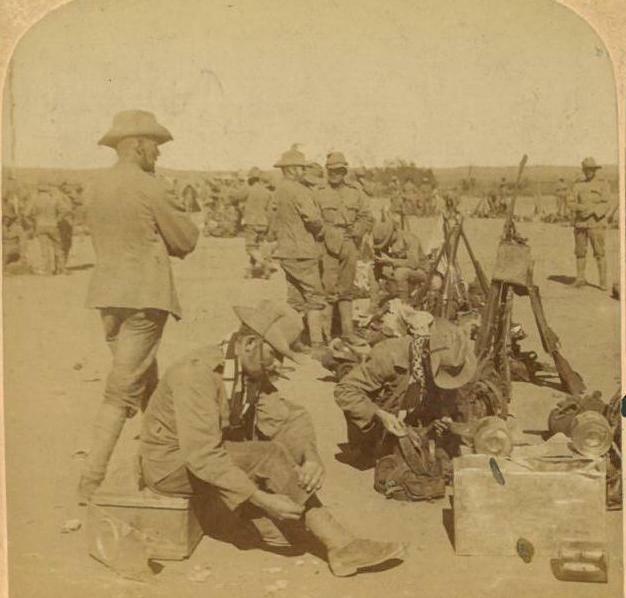 As ever current affairs were big sellers and when the Boer War broke out it was only to be expected that cards were issued depicting scenes form the conflict. 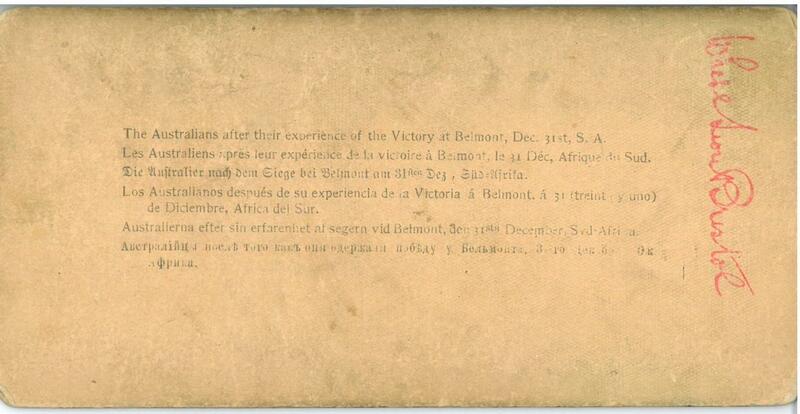 This card is one of those, showing Australians: The rear of the card describes the image as ‘The Australians after their experience of the Victory at Belmont, Dec 31st, S.A.’: The copyright on the front dates the card to 1900, so presumably the photograph was taken on 31st December 1899. The Battle of Belmont took place over a month earlier, so it seems the manufacturers were keen to make their image seem a bit more exciting for potential buyers by linking it to a battle. The card was manufactured by Underwood and Underwood: Underwood and Underwood were at one time the largest stereoscope producers in the world, producing 25,000 cards a day in 1901. 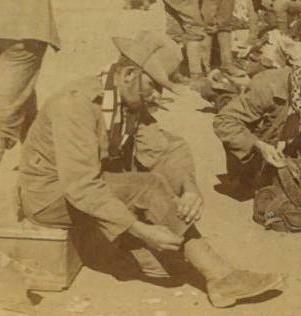 The image itself is of troops relaxing after the battle, with piled rifles: One man is sorting his equipment (note the polka-dot neck scarf): Whilst the chap in the foreground seems to be adjusting his putties: Like the rest of the soldiers he is wearing the slouch hat popular during the conflict. 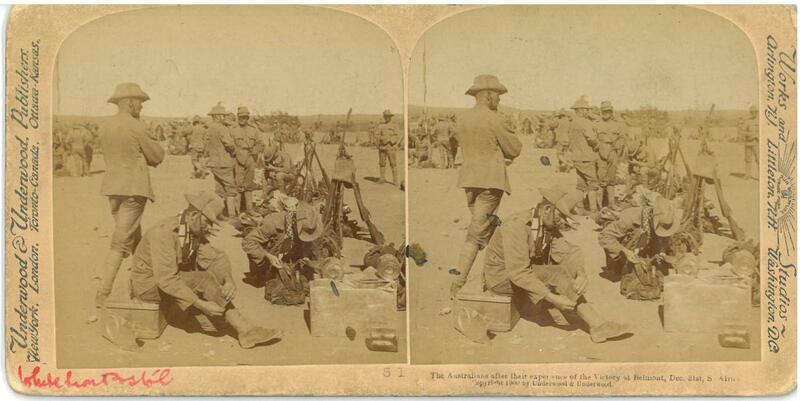 A wooden ammunition box and set of tin cans is also clearly visible: The soldiers in the background have an informality of dress that indicates the photograph was taken in the field: Unfortunately I do not have a viewer to take advantage of the ‘3D’ effect, but I will keep my eyes open for a reasonably priced one and I can then enjoy the card as it was meant to be seen! 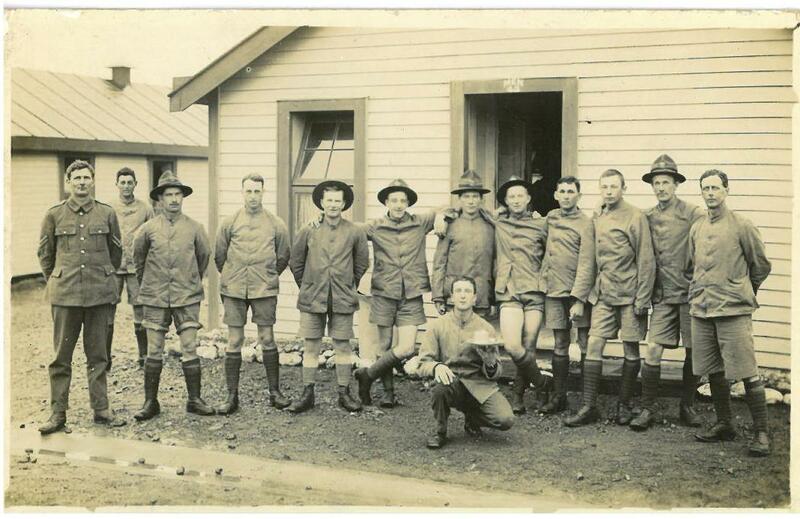 This entry was posted in Australia, Latest Pick Ups, Photograph, Pre WW1 on March 31, 2015 by hatchfive. Thank you very much for your interesting letter. How delighted you must have been when peace was declared and to think that the U Boat danger is gone forever. I suppose though there will be a good deal of work minesweeping before the seas are really clear and made safe. I wonder if you are continuing your course of instruction. Yes I have no doubt it was very interesting and made a fine change from sea life. Fancy your ship carrying as many as 60 depth charges altogether making 18,000lbs of high explosive. You will be pleased to hear that we have had two cards from Robert within the last few days. At least one was addressed to Ethel and she sent it on to us this morning. 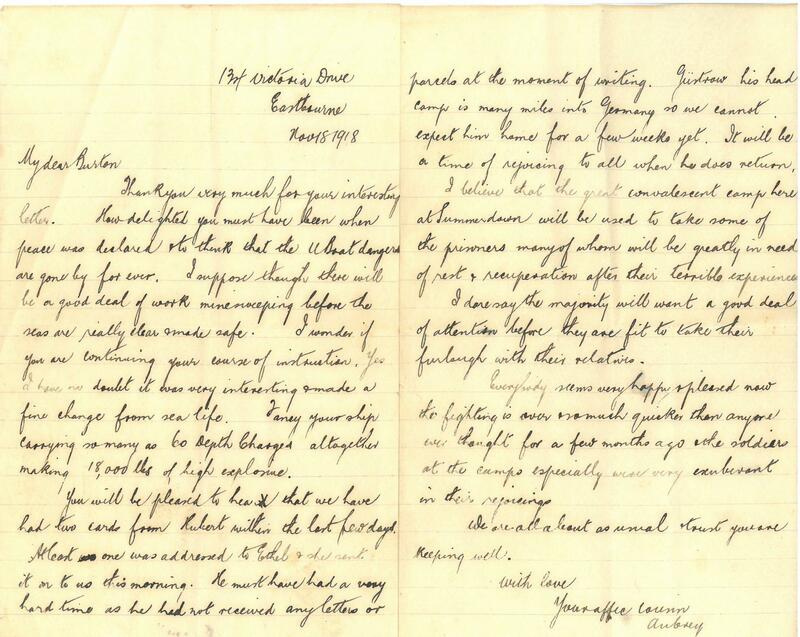 He must have had a very hard time as he had not received any letters or parcels at the moment of writing. Just now his lead camp is many miles into Germany so we cannot expect him home for a few weeks yet. It will be a time of rejoicing for all when he does return. I believe the great convalescent camp here at Summerdown will be used to take some of the prisoners many of whom will be greatly in need of rest and recuperation after their terrible experience. I daresay the majority will want a good deal of attention before they are fit to take their furlough with their relatives. Everybody seems very happy and pleased now the fighting is over so much quicker than anyone ever thought for a few months ago and the soldiers at the camps especially were very exuberant in their rejoicing. The letter highlights the rejoicing and happiness of people, both servicemen and civilians, when the armistice was declared in 1918. 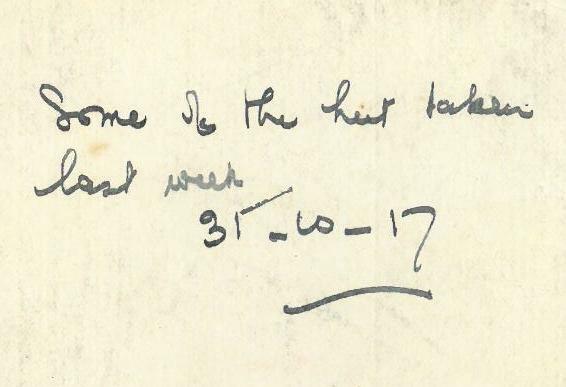 It is interesting to note that the writer of the letter describes it as a peace rather than an armistice and I suspect that most ordinary people felt it was the end of the conflict rather than just a pause as it might have been. It is also interesting that in the week since the 11th November not only has the British Army advanced into Germany, but letters detailing the events have had time to return to Great Britain. We will return to another set of documents from this fascinating collection soon. This entry was posted in Documents, Latest Pick Ups, Royal Navy, WW1 on March 30, 2015 by hatchfive. At the outbreak of WW1 New Zealand was a tiny island nation, with a population little more than a million. Despite this she contributed 100,444 men to the allied cause and suffered the highest casualty and death rate per capita of any nation. 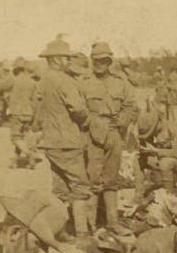 The New Zealand Army fought alongside their Australian cousins in Gallipoli and on the Western Front. 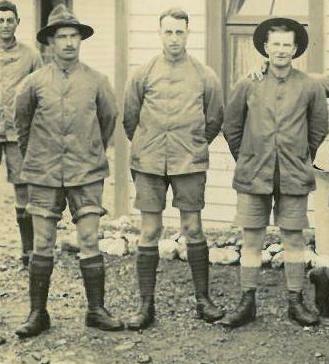 Tonight we are looking at a nice group shot of a group of New Zealand troops in camp: Their national identity can easily be determined by the ‘lemon squeezer’ hats some of them are wearing: Most of the men are wearing shorts and fatigue uniforms: The lengths varying from very short: To longer lengths coming to the knees: The corporal on the left is wearing standard woollen service dress, but without puttees: Above the hut door is a painted sign showing it housed 48 men: The most likely candidate for the photograph’s location is Sling Camp, near Bulford on Salisbury Plain. The camp was created for use of the New Zealand troops and the men built wooden huts much like the one in the background of the postcard. In this view of the camp (showing the chalk kiwi the men carved in the hillside above) the hut on the right bears a close resemblance to the style of accommodation in my postcard: Returning to the postcard, one of my favourite details is the chap front and centre, kneeling down and holding a tray of some sort with what looks like a mug on it: The reverse of the card handily dates it: It reads ‘Some of the hut taken last week 31-10-17’. Sadly the camp was to be the site for rioting and looting by disaffected Kiwis awaiting repatriation once the war was over. 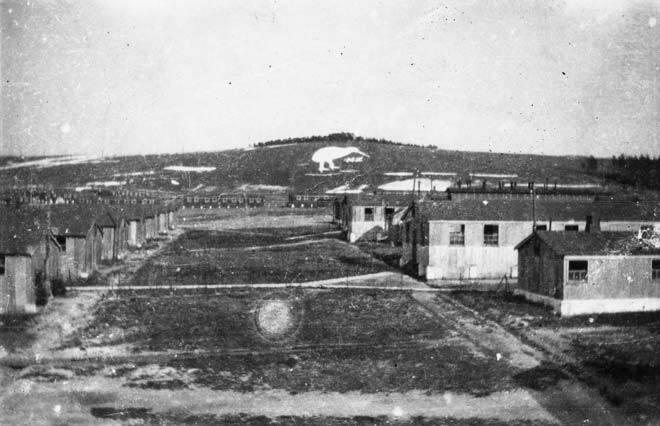 The camp was finally rebuilt in the 1920s, but the chalk kiwi survives. 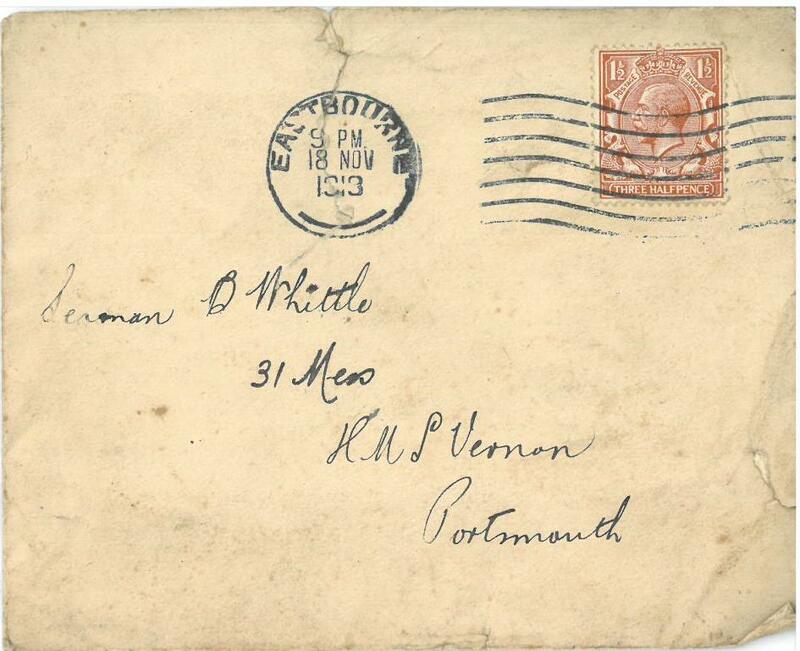 This entry was posted in New Zealand, postcard, WW1 on March 29, 2015 by hatchfive. 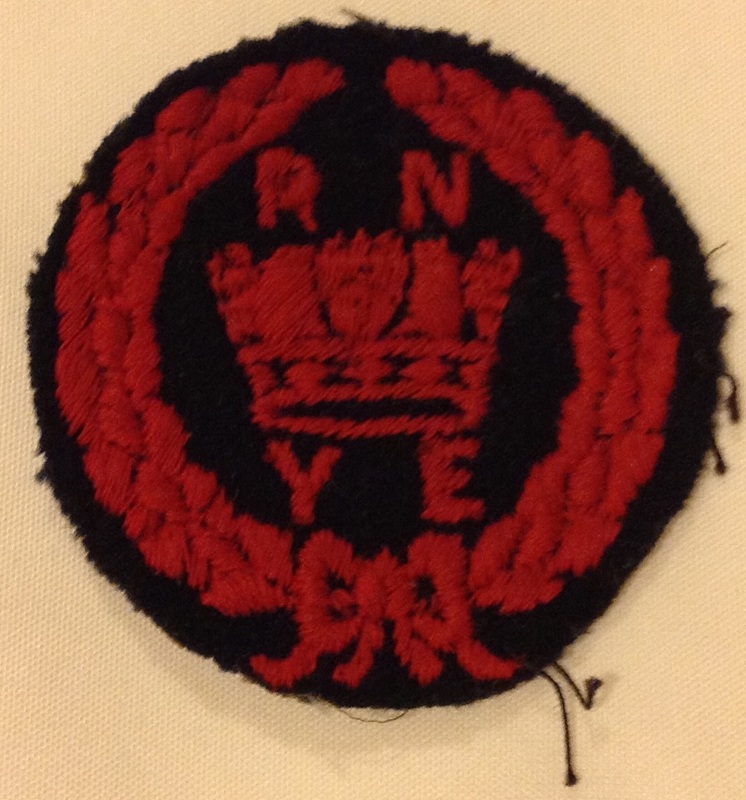 The badge itself is a dark blue felt disc, embroidered in red: As can be seen the design is a laurel wreath, with RNYE and the naval crown within it. 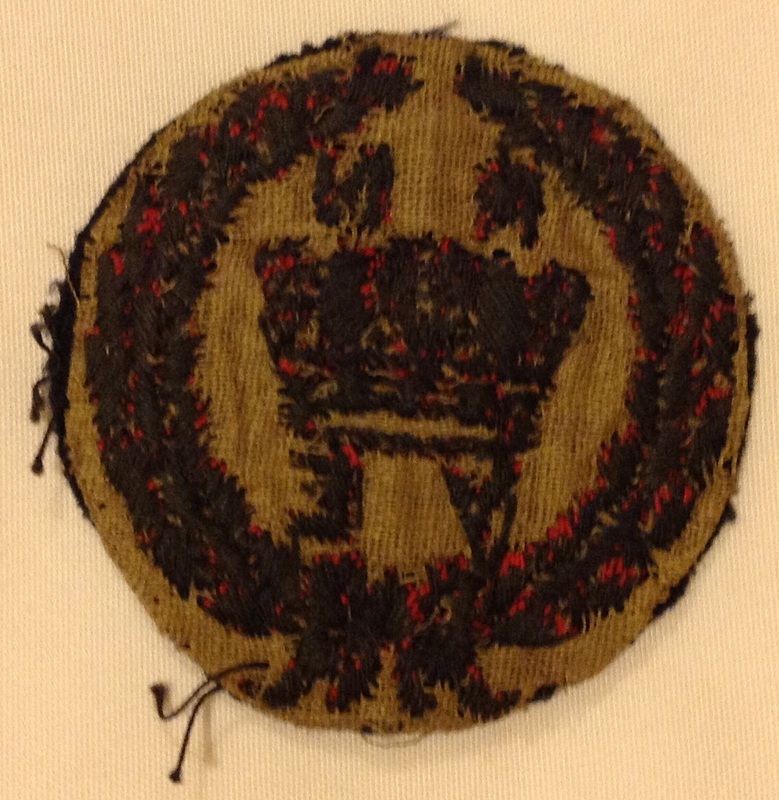 The back of the badge has a backing of tan cloth: The badge was worn by members of the Sea Cadets, Home Guard or Air Cadets before they were called up on the sleeve of their cadet’s uniform. 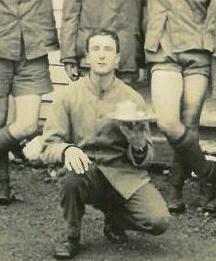 The potential officer candidate then continued his youth service until he was of age to join the RN. The scheme was advantageous for the Navy as they got the pick of the brightest young men, whilst the candidates were guaranteed a chance to become and officer and thus avoided the random chance of conscription, where they might end up in the Army, RAF or even down the mines as a Bevin Boy. I have searched n vain for a period photograph showing a young man wearing one of these badges, but if anyone does have one please let me know. 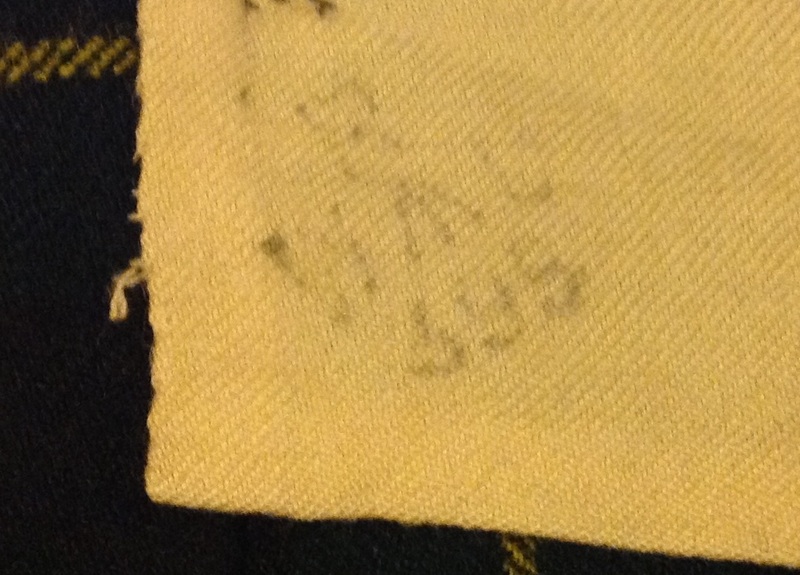 This entry was posted in Home Guard, Insignia, Royal Navy, WW2 on March 28, 2015 by hatchfive. 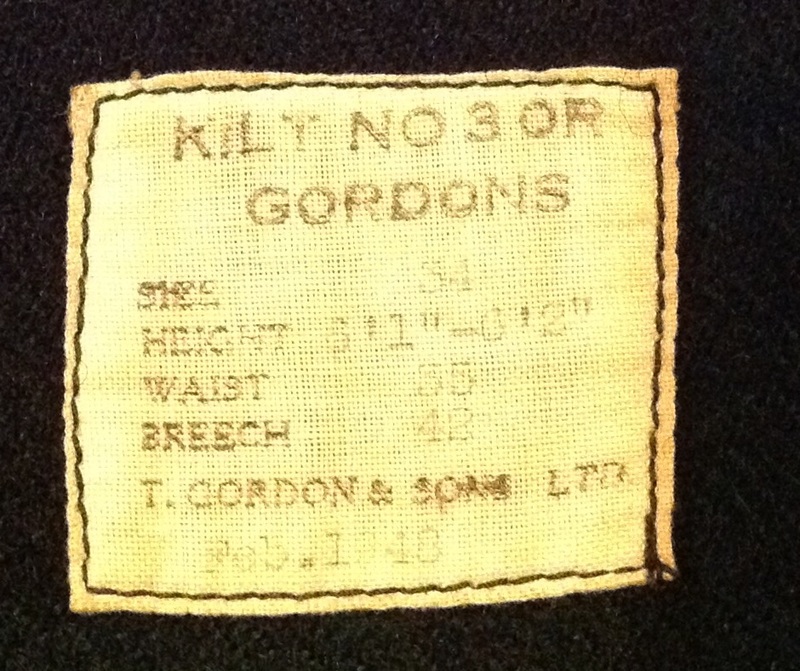 Despite this the regiments fought to keep hold of their traditional kilts and during the Battle of France many stretcher bearers in Scottish regiments continued wearing the kilt: Tonight we are looking at a WW2 era kilt from the Gordon Highlanders: As can be seen the kilt is made of heavy worsted wool in the tartan known as Government Sett with yellow stripe. 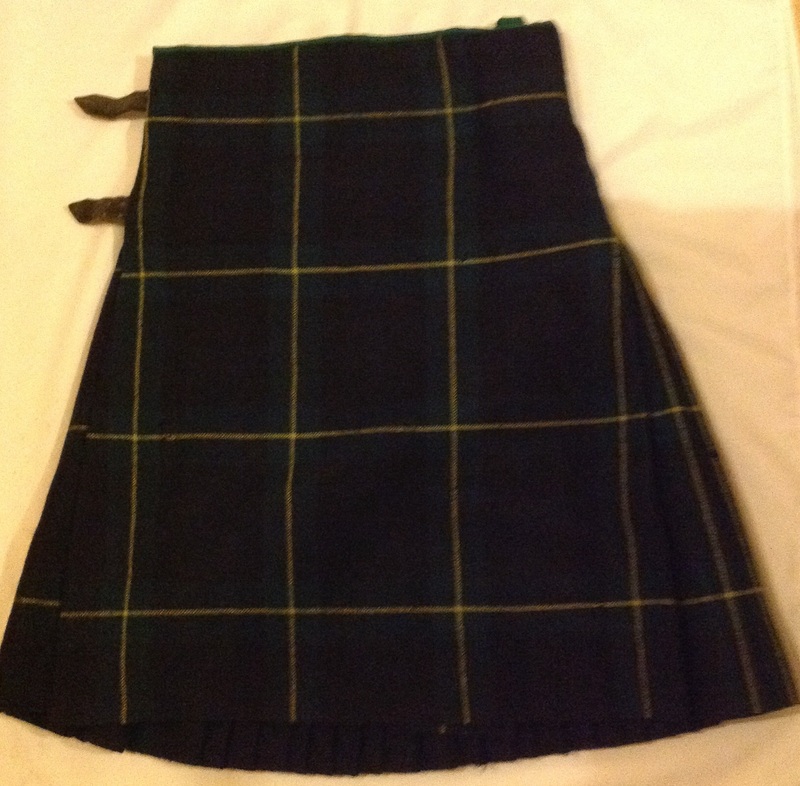 The Government sett was a basic blue and green tartan as worn by the Black Watch, different coloured stripes were woven over this basic design to give regiments their own design of tartan. 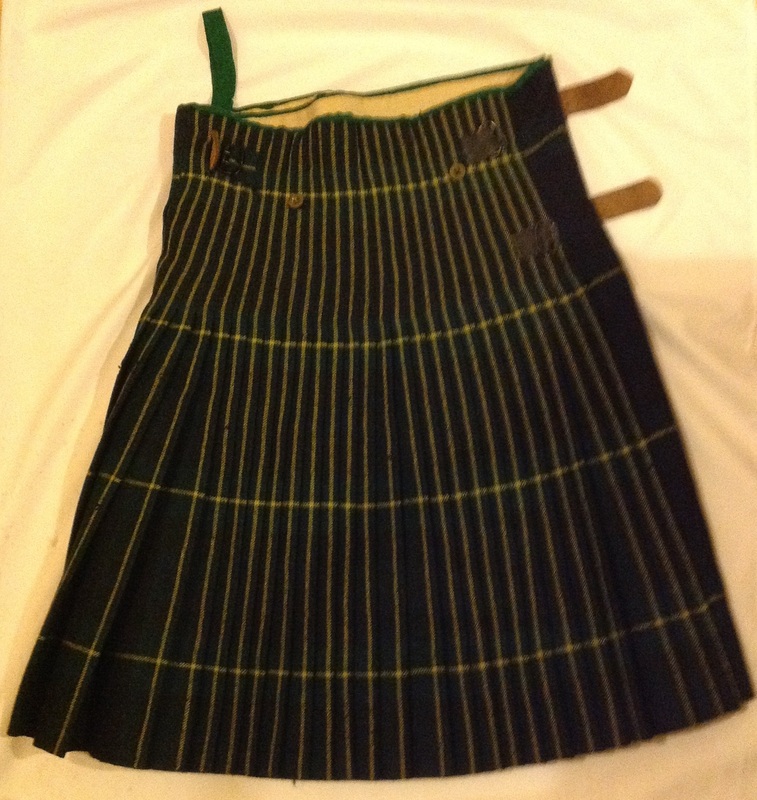 The apron at the front of the kilt is plain, whilst the back of the kilt has knife pleats: The kilt is made of between eight and nine yards of fabric and is consequently fairly heavy. 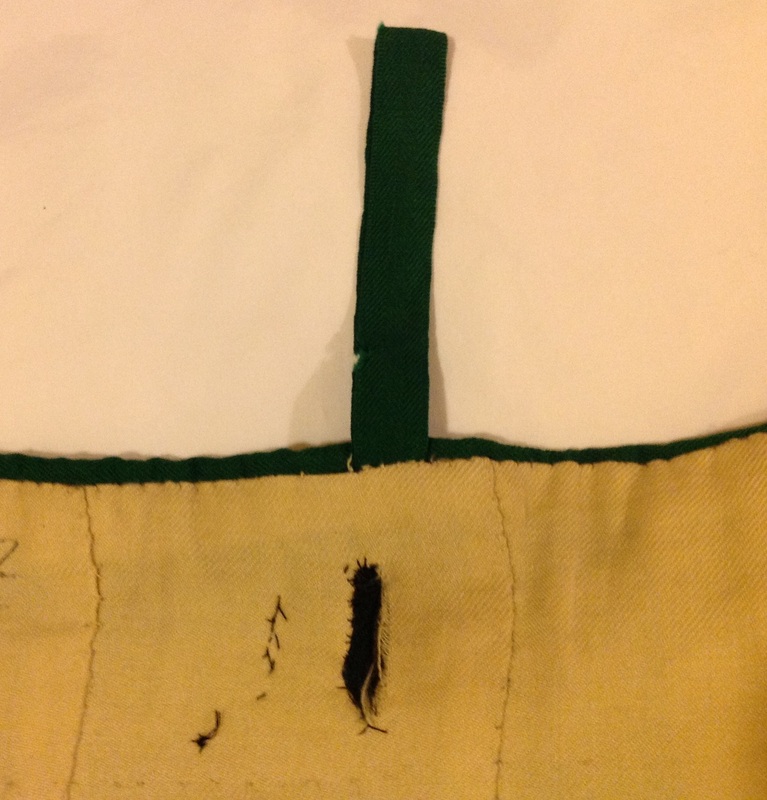 It is lined at the waist with white cotton fabric: The bottom of the kilt is not hemmed as it would not hang correctly, but the fabric is selvedged to prevent fraying. 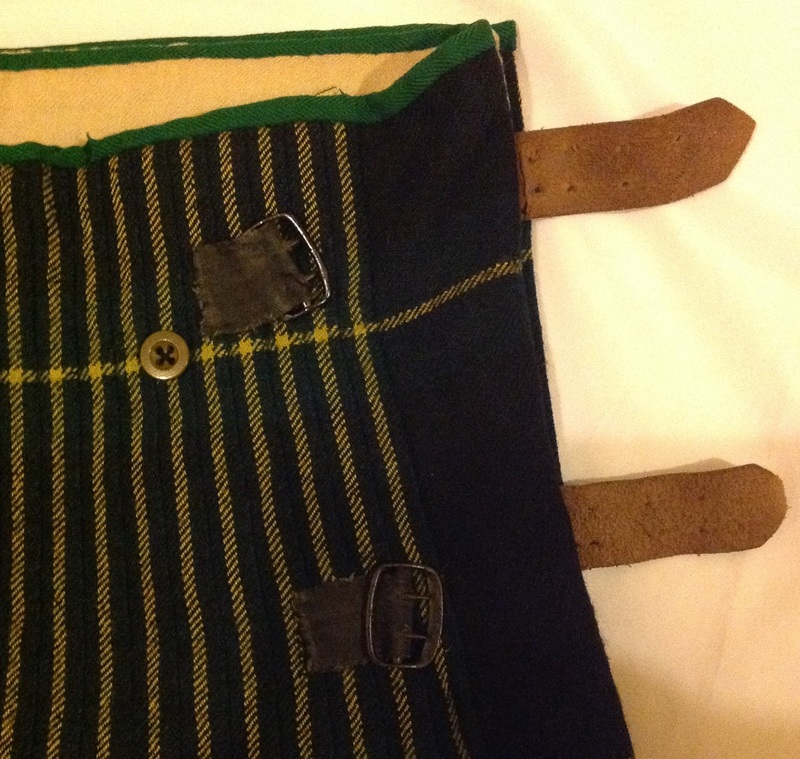 The kilt wraps across the body, with a single buckle passing through a slit on the left side and a pair of buckles on the right: These were issued unattached so the garment could be adjusted for size. 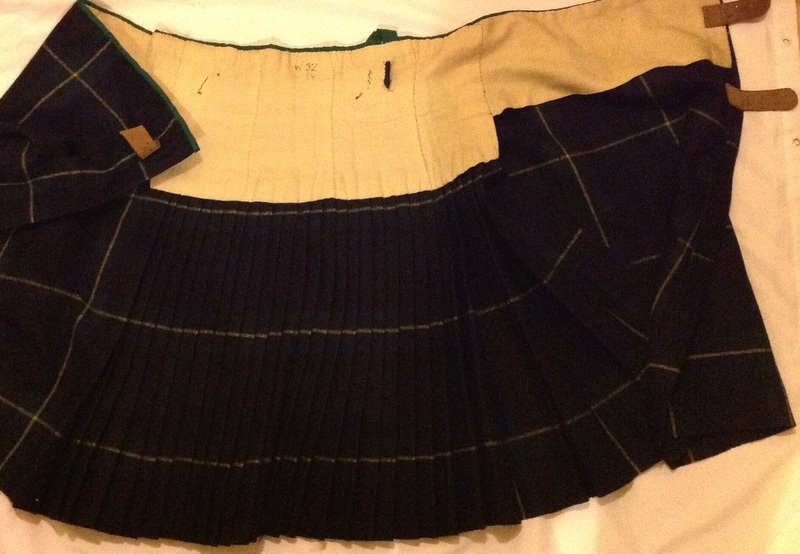 This kilt is marked with a /|\ stamp and letter code R for 1948: A label gives sizing information and is sewn inside the kilt: There would also have been two cotton tapes sewn in to loops on the waist to allow the kilt to be hung, sadly only one remains on this kilt: A plain cotton kilt apron would have been worn over the top of the kilt in the field, protecting it and offering further camouflage. 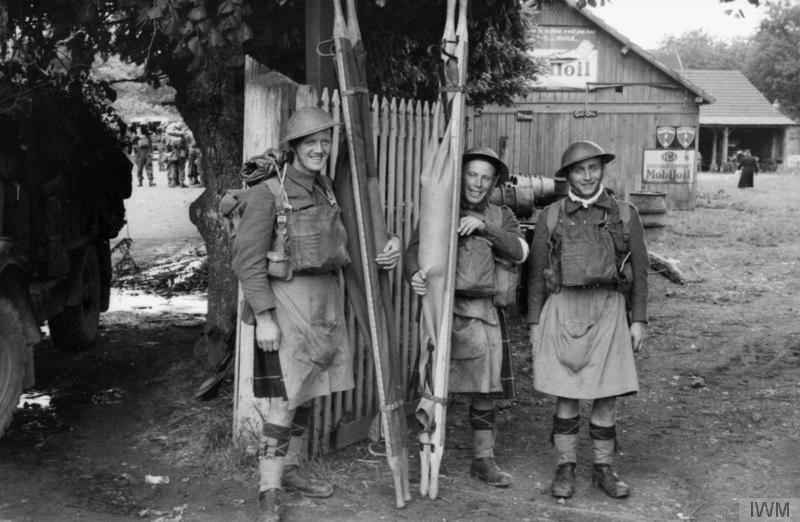 Despite its abandonment as a front line garment the kilt continued to be worn off duty by those men who already had them, and officers were permitted to buy surplus other ranks kilts for their own use. As the most obvious symbol of the regiments Scottish heritage, the kilt was worn wherever possible and many Scottish regiments ensured they had sufficient quantities to equip their men for the victory parades in 1945. 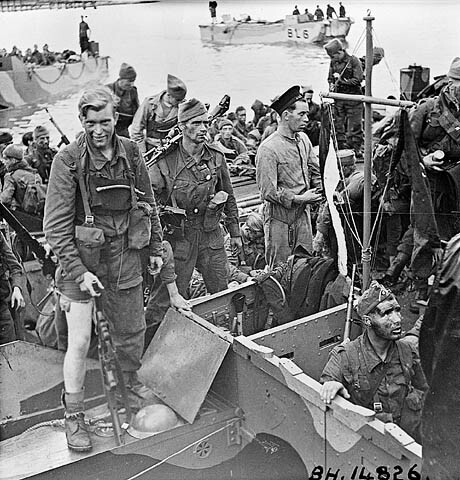 This entry was posted in British Army, Latest Pick Ups, Uniform, WW2 on March 27, 2015 by hatchfive. Although now commonly associated with the Commandos of WW2, the cap comforter was a comfortable and popular item of head wear worn by nearly all British troops at some point in their career from the early nineteenth century to the present day. The cap comforter consists of a woollen knitted tube closed at each end. 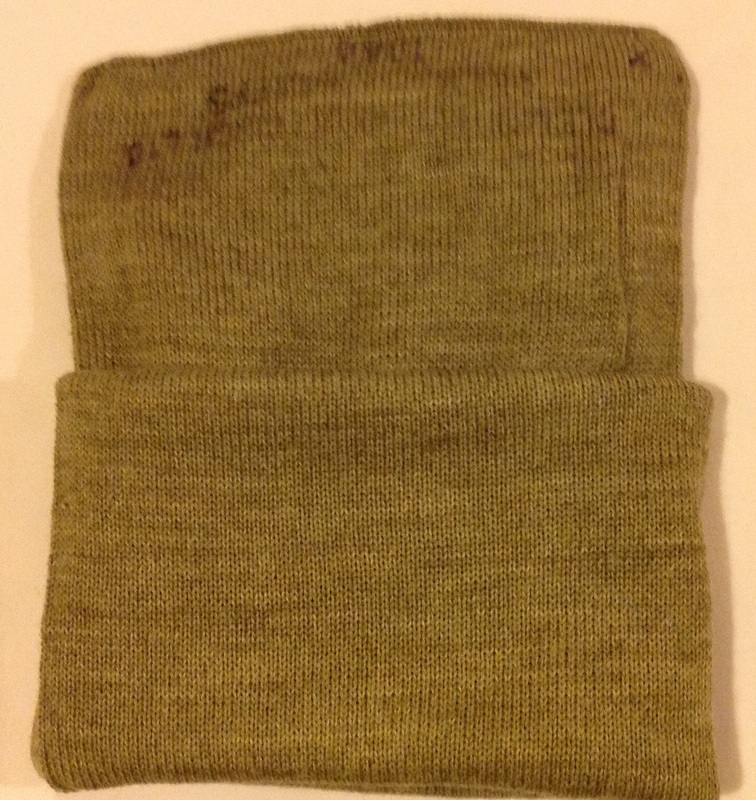 Folded out it can be used as a small scarf: By half turning it inside out and then turning up the open end, a hat can be formed: These hats are comfortable, informal and very good at keeping the head warm and were thus popular amongst troops on active service. They were often worn by soldiers in the Great War when on trench raids as their silhouette was not as obvious as the steel helmet. 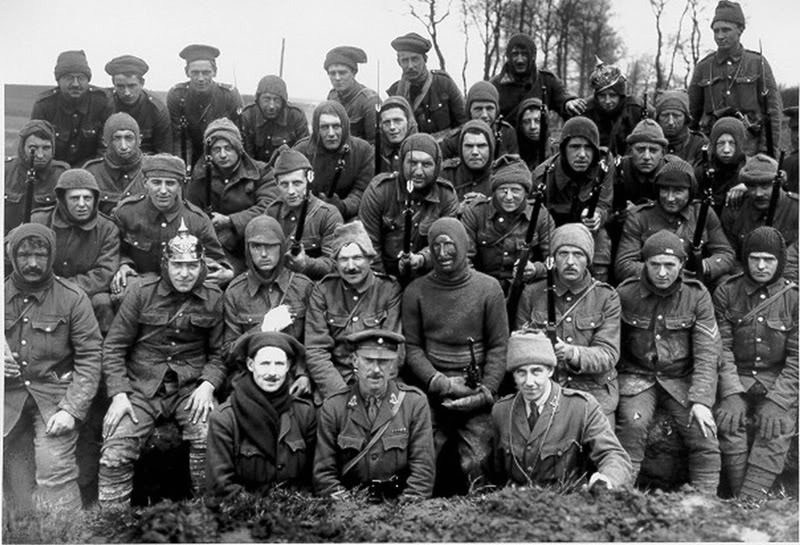 The picture below is of the 1/8th Kings Liverpool Regiment at Wailly, Arras in 1916, note the cap comforters worn by several members of this trench raiding party: The cap was recorded in Army Orders in 1902 as “Cap, fatigue, comforter: Knitted in brown wool, and can be used as a stable or fatigue cap, and as a neck wrap with service dress jacket.” The cap comforter was very practical as it could be stowed in a pack or pocket without fear of creasing and was frequently worn under a steel helmet to add comfort and prevent too much heat being drawn from the head by the cold steel shell. It was available in three sizes based on the size of helmet it was worn under, Size 1 was for cap sizes up to 6 ½ size 2 for helmets from size 6 5/8 to 7 1/8 and size 3 was for cap sizes above 7 1/8. These sizes should have been stamped onto the hat, but are not always clear. 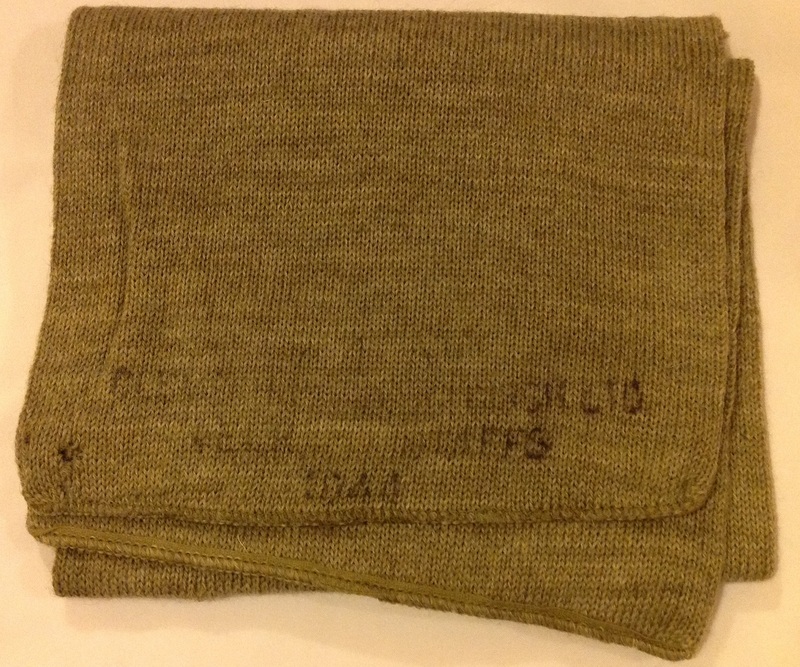 This example is dated to 1944: As can be seen it is made of machine knitted pale khaki wool, with the date stamped onto the exterior in black. The colour did vary later in the war with olive green and brown versions produced. They continued in use after the Second World War and are still used today, making them one of the longest serving pieces of military clothing in the British Army. This entry was posted in British Army, Headress, Latest Pick Ups, Uniform, WW2 on March 26, 2015 by hatchfive. I have been slowly putting together an Indian 37 pattern webbing set for the last year or so and I have now picked up the last piece I was missing in the shape of a small pack. As is often the case with this hobby, I was given a tip off from another collector who knew I was after one and happened to spot it, in this case from the other side of the world. 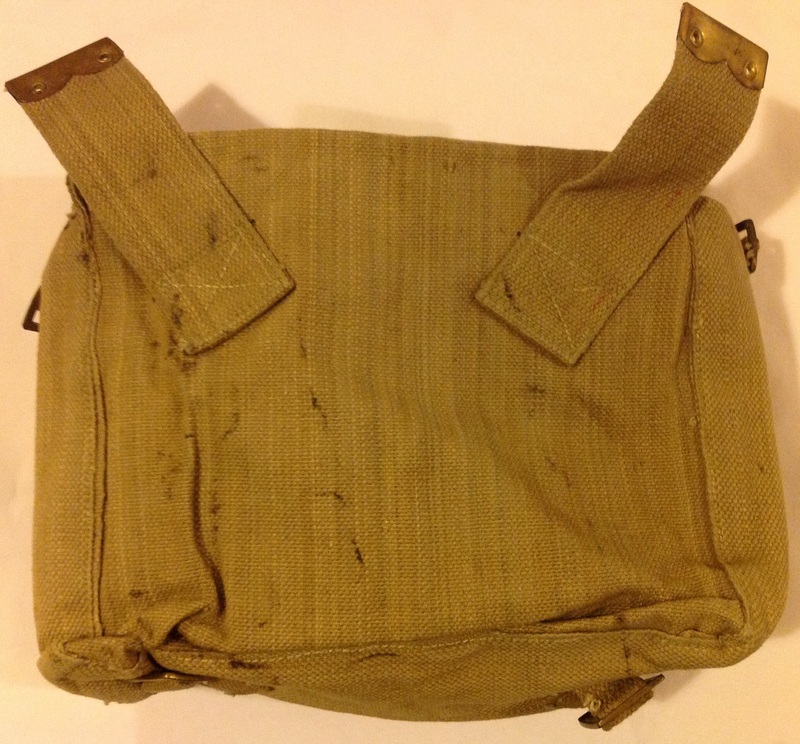 There is a very international theme to collecting militaria- the tip off came from a collector in the USA, the seller dispatched it from Greece and the haversack was made in India! Therefore many thanks to Mike, and please check out his excellent Facebook page on Empire uniforms here. 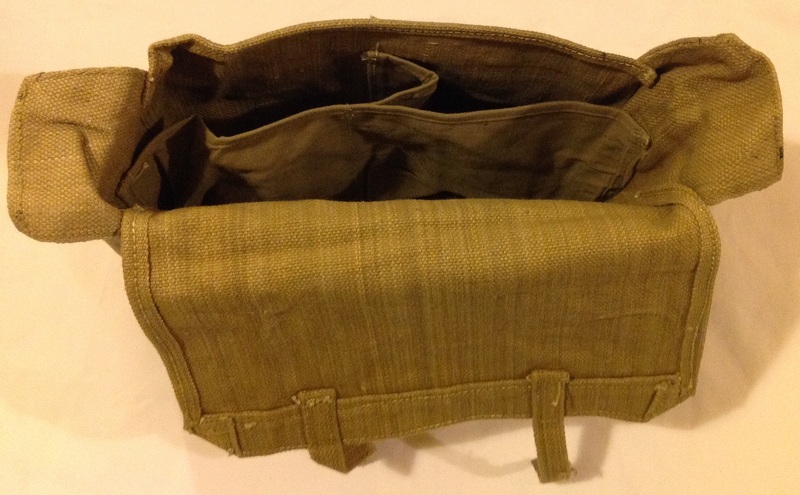 Haversack- This consists of a rectangular bag of dimensions approximately 11 inches by 9 ½ inches by 4 inches: and has a flap secured by two small straps and buckles: The interior is longitudinally divided by means of a partition, which is in turn connected to the front of the bag by a small partition to form two front compartments of equal size. 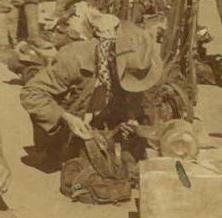 These compartments contain the water-bottle (in carrier) and rectangular mess tin: On the back of the haversack near the top two tabs are fitted for the attachment to the shoulder straps: and on the base two small buckles are fitted for attachment of the diagonal portion of the shoulder straps: Weather flaps are provided which fold in underneath the flaps. As can be seen this pack is made of the distinctive Indian webbing that has a slightly ‘striped’ effect to it. The fabric is of a coarser weave as the cotton used in India was of a different variety to that in use elsewhere and this leads to the rougher texture. The brass fittings are slightly cruder than those made by Britain, Canada and Australia but still perfectly serviceable. 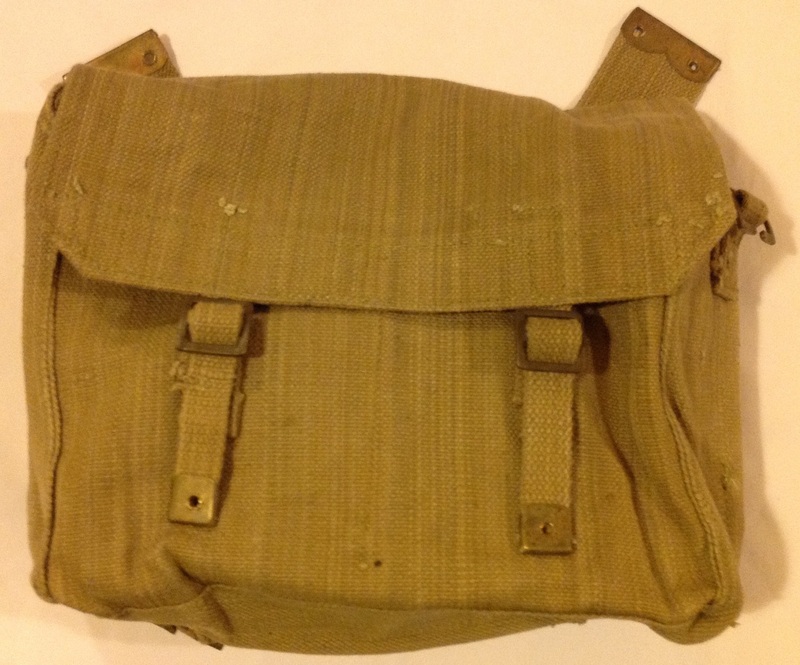 The manufacturer’s details and the date, 1942, are stamped onto the front of the haversack, hidden under the top flap when it is closed: I am pleased to finally finish this set, although I am now looking for Indian made personal kit to fill the small pack! I am also working on putting together an Indian made set in pre-dyed jungle green, but that is another ongoing project…I have too many of those. 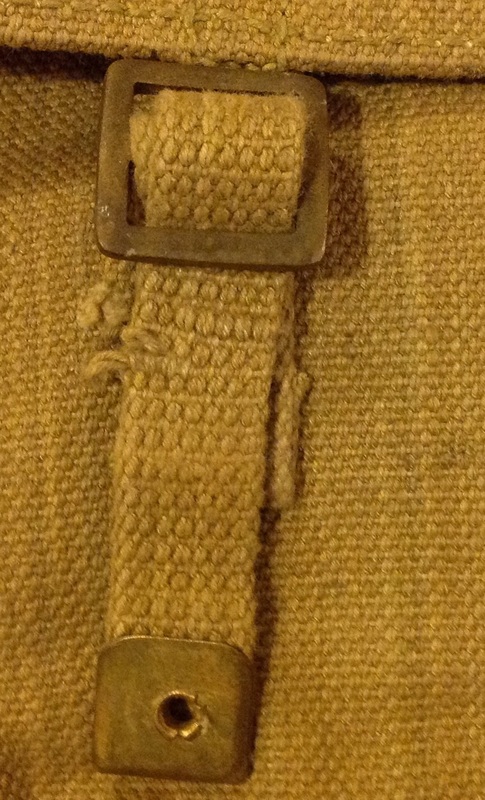 This entry was posted in British Army, India, Webbing, WW2 on March 25, 2015 by hatchfive.